Cold and Intense. 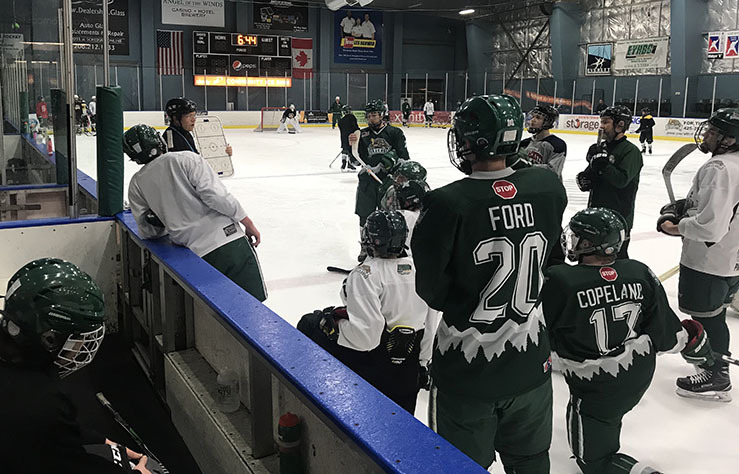 As the team, Everett Jr. Silvertips 18UC Grizzlies gathers around coach Joe Hammond for an explanation as to how to run the next drill. Before the team gathered once again, they worked on passing the puck at certain angles at which would help them score at a better rate. “The season so far has been a good one and has been a lot of fun. The team is full of a wide range of skill levels, so it has been exciting to see how each individual performs on the ice and give to them. We are currently midway through the season with an upcoming tournament in Bremerton,” senior Cameron Ford said. Lake Stevens is known for having outstanding sports teams from varsity football to wrestling. However, there are some sports we do not offer to students. In order to take part in activities such as rowing, hockey or lacrosse, students look elsewhere for an outlet. Senior Ainsley Mattingly is incredibly involved in school activities, such as ASB, band and drumline though she dedicates her after-school hours to rowing. Mattingly has only been participating for a year, but she has already made it onto the league’s varsity team and received an MVP award for her efforts last season, and is looking to row in college. After filling out recruiting questionnaires, she was invited to officially tour the University of Oklahoma, Gonzaga University, University of Louisville and the University of Notre Dame to row for them and has settled on going to Louisville after this year. “I always knew that if I picked any of these other schools [besides Gonzaga], I should definitely pick Notre Dame ‘cause it’s so prestigious and that’d be so cool to be like ‘I’m going to Notre Dame’, but I was like, if I pick any of these other schools I know I’m going to regret not picking Louisville ‘cause I just knew that’s where I wanted to go,” Mattingly said. Though she has played volleyball and run track for the high school, her passion resides in rowing. “One, I don’t have time to do any other sports, but also I don’t really have the desire to. I’m so 100 percent in rowing that I wouldn’t want to do any other sport,” she said. Also fairly dedicated to his sport is senior Cameron Ford. He originally got into hockey because his dad used to play and started playing himself when he was just 5 or so. Last year Ford played on an elite 16U A1 team; however, since breaking his ankle and entering his senior year, he opted for an 18U C team to lower his stress levels while applying to various Ivy League colleges. Ford takes his education very seriously, and though it takes a lot of time and energy, hockey won’t get in his way. “There’re a lot of road trips, a lot practices, a lot of games, so that meant I had to bring my textbooks with me in the car to study while my dad was driving. And doing homework, in Canada and at the rink. And also when I did golf for the school, during the championship game,, I asked my coach if I could bring my calculus book onto the field with me, and then he said no so I snuck out some note pages for calculus because the AP test was the next day,” he said. Even with all his sports-related activities taking up a large portion of time, Ford has managed to maintain his 4.0 GPA, which he hopes will impress his first choice college, Stanford. In addition to his academic triumphs, he has managed to win first in various tournaments, win state twice, has been captain of almost every team he has been on and has received multiple MVP awards. In the free time that Ford manages to find, he is attempting to make a short film with a few close friends who he has casted as stars. In addition to hockey not being offered at regional high schools, lacrosse is also a sport that is more challenging to find in Washington high schools. Junior Zebulan Potter was first introduced to lacrosse by a friend and has now been playing for a year and a half. The sport may not be as involved as Ford’s hockey schedule; however, in the off-season, Potter’s team continues to practice and works on conditioning. Lacrosse is becoming more popular in our area, yet Lake Stevens still does not have a team. “The team I play for is a mix of Snohomish and Lake Stevens, and we play under the name Snohomish but will eventually get a Lake Stevens team,” Potter said. Before starting lacrosse, Potter ran track and cross country for LSHS. Though he plans on playing lacrosse throughout high school, he has decided to take off this season. Between academics, social lives and extra curriculars, today’s typical teenager is kept pretty busy; however, these individuals truly take the cake.